Entropion is a term used for describing the turning in of the lower eyelid and lashes towards the eye. The majority of entropion are due to over action and over riding of the lower eyelid orbicularis muscle, probably as a result of the ageing process. These can include irritation and discomfort from the lashes turning inward and rubbing on the surface of the eyeball. Entropion will need to be repaired surgically, before the rubbing of the eyelashes causes damage to the surface of the eye. Whilst waiting for surgery you may be advised to use some micropore tape to hold the lower lid down, consequently relieving the symptoms. Sometimes, Botulinum toxin can be injected to the eyelid to prevent the eyelid turning in. This is effective usually for 2-3 months. The surgery to repair entropion is usually performed under local anaesthetic. 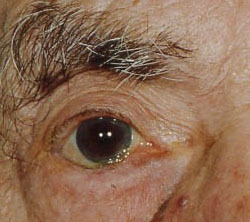 This will involve tightening of the lower lid, therefore correcting the lower lid laxity and in turning of the eyelid. This is not a small procedure and will take approximately 45 minutes. There is a small chance of recurrence in some patients. Two weeks before surgery you should liase with your doctor to discontinue any medications that increase the chance of bleeding: such as Aspirin, Warfarin and non-steroid anti-inflammatory agents.